A rain chain is an instant upgrade to a typical gutter downspout that directs rainwater to move gracefully down the channels. 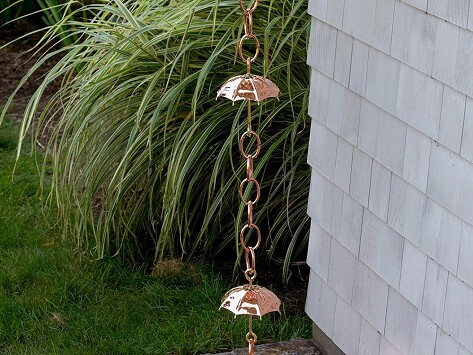 Based on traditional Japanese rain chains, it is handcrafted in India entirely from copper that will patina over time and is guaranteed to last a lifetime. Dimensions: Bluebell: 3" x 3" x 102"; Pineapple: 4" x 4" x 102"; Fish: 4" x 4" x 102"; Umbrella: 6" x 6" x 102"; Single Link: 2.5" x 2.5" x 102"; Double Link: 6" x 6" x 102"
Weight: Bluebell: 5 lbs. ; Pineapple: 4 lbs. ; Fish: 4 lbs. ; Umbrella: 4 lbs. ; Single Link: 3 lbs. ; Double Link: 4 lbs. Adds elegance to your yard. When I saw The Rain Chain on your website, I knew I had to have one. Plus it was the perfect gift for my friend. We used to see them all over the place in Tokyo. Why I never bought one I’ll never know. I ordered the Rain Chain w/the Flower for my daughter & son-in-law for Christmas .... They loved it! They had been wanting one for quite some time, but had not been able to find one of the quality they wanted. So, when I saw these in the Grommet, I knew it was The One. Real Copper! Beautiful! Absolutely love!! Beautiful! Would like to keep it the bright copper, my personal opinion.